Kestrel in Malta: sitting target? No, it's already been a target. We ran this article a couple of years ago, and it’s deja vue to read it again. Each year, the spring hunting season opens just as migratory birds make their pilgrimage northwards (which is what their flight is akin to, given the hardship en route if they fly over or land in Malta). Each year, BirdLife Malta sets up a monitoring camp to watch their progress and report on any infringements of the EU’s Bird Directive. Sadly, each year, some hunters do flout the law, and protected, rare even, migratory birds that are the common heritage of all, are shot down in Malta. 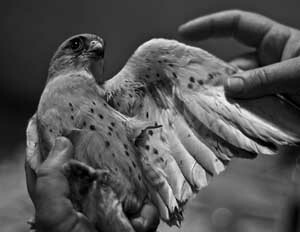 The Times of Malta has news today of the latest atrocity – the injuring of one of Europe’s most endangered birds of prey, the Pallid Harrier. Of course, the infringements are by a few hunters set on tarring the whole hunting community with the same brush. But, for all the cases BirdLife happens to come across, there will be more, unseen infringements. When bird numbers are so few, as in the case of the Pallid Harrier, just a couple fewer of these beautiful, rare birds makes a huge difference to the sustainability of their population. We’re running our article again, below, as the sentiments still stand; and the photo says it all. I’ve been waking up early since the lighter, spring mornings. But apart from a few sparrows chirping in the olive tree below and the church bells ringing mass, it’s a quiet start to the day at 6am. But for how much longer? Something is missing from spring – that other traditional Maltese wake up call, gun shot. Hunters lead shot isn’t yet peppering the spring dawn in my area. The question of whether it will or not this year is in limbo. MPs, NGOs both local and international, pro- and anti-bird hunting lobbies and the mass of regular citizens caught somewhere in the middle, wait to see if government will declare for or against opening a spring hunting season at all this year. If it does, the season will be mercifully short for birds, as spring is already ebbing away and according to some hunters the best pickings have already flown past. Malta has to abide by the EU’s Birds’ Directive which expressly forbids spring hunting and trapping. But Malta has exercised its right of derogation – which is supposed to operate under very narrowly-defined clauses – to allow spring hunting since its EU membership in 2004; except in one year, 2008, following a European Court of Justice ruling which said Malta had broken the terms of the derogation by allowing quail and turtle dove hunting in spring. If some 122,000 people, mostly from across Europe, had their way, Malta won’t have spring hunting at all with or without nice, legally-worded derogations being evoked. This was the number of people who signed a petition against Malta’s spring hunting that was handed in to the Office of the Prime Minister yesterday. The number of people handing it in was around 10, a group mostly made up of BirdLife Malta members. In fact, the whole pro- or anti-bird hunting lobby issue is a numbers’ game: how many locals does BirdLife Malta speak for really? How many Maltese are anti-hunting but won’t stand up and be counted? How many hunters’ votes swing our various election results? How many protected birds are shot down illegally and during close seasons? How many hunters shooting birds illegally slur the name of the (legally operating) hunting fraternity…and so on. The end sum of course isn’t really about numbers or how long the spring hunting season should or shouldn’t be. The real issue is illegal hunting – and its spring hunting season is well under way while hot air gets traded everywhere from Brussels to Malta. On a wing and a prayer - it survived. That one might live to see flight (in both senses) and another day. But let’s hope it doesn’t pass over Malta next time as it migrates. And I hope I don’t start hearing gun shot at 6am. Photos: courtesy of Sean Mallia (great shots Sean, many thanks for sharing!). Previous Post Digital Nomads: can Malta attract them? Next Post Burlesque is back in Valletta!